Eleni Odysseos (b. Ammochostos, Cyprus) lives and works in London and Nicosia, and has an MFA in Fine Art from Goldsmiths, University of London. 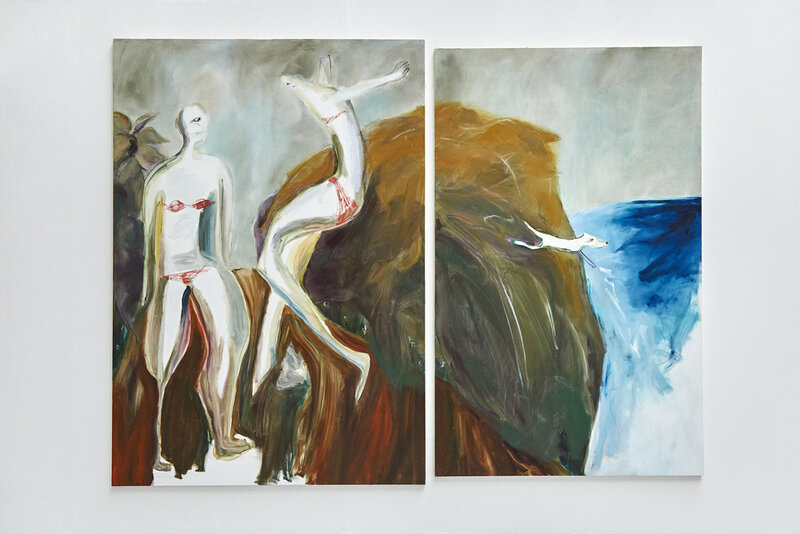 Her paintings, often shown on their own or accompanied by sound pieces, explore isolation, desire, power structures (i.e. control, tales of leisure and consumerism, sexual hierarchies), and the effect of those on our identities and bodies. Dying birds, muddy backgrounds, suggestive landscapes, decaying flowers, deteriorating bodies, domesticated dogs and flamboyant flamingos act as signifiers that, when positioned together, generate abstract narratives. This is her way of exploring the construction of our subjective realities and meaning-making in a post-truth condition. Recent exhibitions include A Change in Weather at No Format Gallery - curated by Oana Damir and Tea Gradassi (2018), Beyond the Standard Model at Almanac Projects, London (2018), Lynn Painter-Stainers Prize Exhibition at the Mall Galleries, London (2018), Slightly Seared on the Reality Grip at Unit 5 Gallery, London (2018) and Prepositions at Kunstfabrik, Berlin (2017). Upcoming exhibition at Korai Space, Nicosia.